Santa’s Mailbox is OPEN !! Santa’s Mailbox is open in Elysburg. In cooperation with Santa Claus and sponsored by The All Home Days and Ralpho Township Business Associations, Santa’s Mailbox will be open from November 18th thru December 18 at the Ralpho Township Community Park in Elysburg, Pa. Area families are encouraged to visit and see the lights and decoration displays. Then drop off those letters for Santa in his mailbox. Please use a return address if you would like to receive a response from Santa. In order for Santa to send out his reply all letters must be put in the mailbox no later than December 18. The mail box will remain open until Christmas Eve. 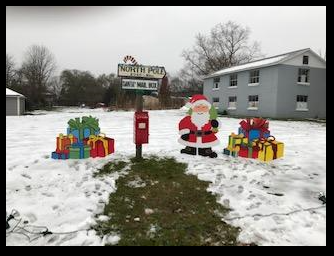 The All Home Days and Ralpho Township Business Associations are sponsoring Santa’s Mail Box with the help of area businesses and individuals. This is our seasonal plans for the area’s community park entitled, “Light the Park.” Monetary donations will be greatly appreciated and can be sent to ‘Light The Park” Ralpho Township Business Association, PO Box 218, Elysburg, Pa. 17824.